FEEL THE LOVE NOT THE HEARTBURN! 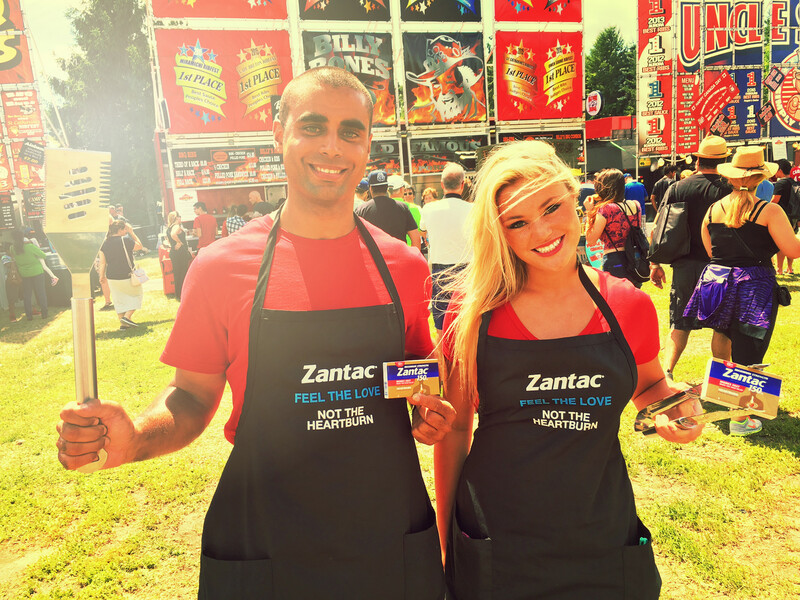 That’s right, two hundred and sixty thousand foodies at Canada’s largest Rib Festivals were feeling the love not the heartburn with ZANTAC®. It was all about engaging people in the “moment of need” and becoming the go-to solution for every food lover. Now everyone can enjoy the foods they love again! As one customer said, “I was just telling my wife I am going to need something for my stomach after today.” Now who would have known that? What really made us stand out was a series of elements including negotiation of sampling integration within the festival agreements, premium placement at main entrances and exits, the relevant set-up consisting of a branded tent and multiple 13ft flags surrounding the food tent areas with “Feel the Love Not the Heartburn” messaging, highly trained brand teams wearing relevant branded chef aprons, and BBQ’s and rolling carts filled with product samples for quick distribution. The food festival strategic partnerships really paid off for the brand and besides being the “most loved” brand at the festival, engaging people at the moment of need delivered greater results. An incredible 121,000 samples were distributed at the point of need while reinforcing key brand messages over two of Canada’s largest rib festivals. With limited resources, we exceed brand plan of 75,000 samples. We expanded brand awareness and reach through various touch points including the main stage LED screens to achieve 260,000 memorable brand impressions. Through our onsite market research conducted in order to measure and maximize the activations ROI, indicated that 44% of consumers never heard of ZANTAC® before and 66% of consumers engaged suffered from Heartburn before. Ever wonder what causes heartburn? It’s the acid from your stomach irritating your esophagus. But what causes that? The short answer is: It varies with each person. Despite the array of heartburn causes, they can be grouped into two simple categories: first, those that relax your lower esophageal sphincter (LES) – which makes it easy for the acid to get out (move up the esophagus) – and then those that make your digestive juices more acidic, meaning you feel the burn more. This is true for both foods and beverages that cause heartburn, and other triggers related to your lifestyle. What Does Heartburn Feel Like? Is the pain or discomfort you have been feeling, heartburn? If you are experiencing a burning in or behind your chest there’s a chance it could be. “Heartburn, also known as pyrosis, is an uncomfortable burning sensation in the retrosternal area, which is the area located behind the breastbone in the chest,” says Victor Wong, PharmD, a pharmacist in the Greater Toronto Area and teaching associate at the University of Toronto Faculty of Pharmacy. Now that’s no way to enjoy a food festival, is it? Take ZANTAC® 150 Cool Mint Maximum Strength during the day for up to 12 hour acid production control. Next PostIs Bigger Really Better?